Dearest Blog: Yesterday it was off to Marquee Cinemas for the entertaining-as-it-is-depressing Money Monster. Spoiler level here will be mild, nothing you wouldn't know from the trailers or if you've personally been hosed in the Market, I guess. When one of his stock tips proves to be a bust, a brash TV presenter and his crew are taken hostage by an unhappy investor. Money Monster is a bit hokey at times, but that's about its only shortcoming. Blessed with two of Hollywood's most capable and engaging leads, George Clooney and Julia Roberts, and edge-of-your-seat storytelling, the movie grabs your attention and does not let go. Jack O'Connell is also terrific, and it's a credit to his performance how easily you'll begin to side with the guy waving the gun around. 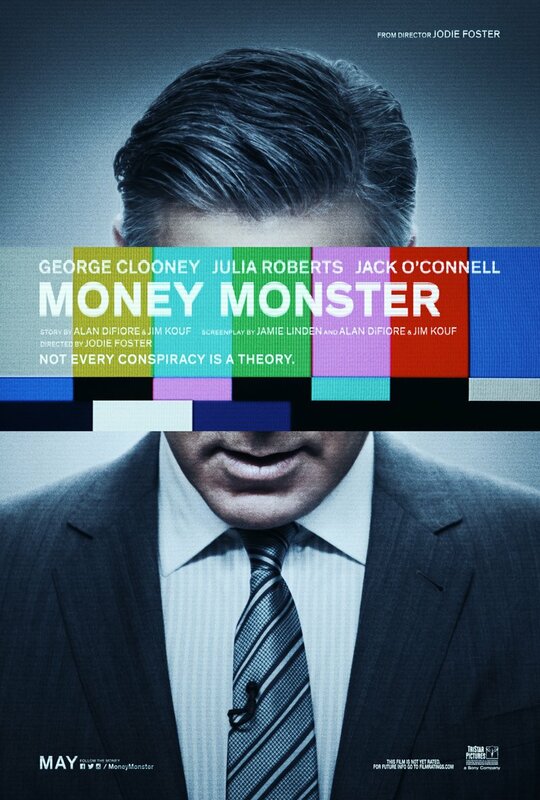 Money Monster expertly maintains tension throughout, spelled with perfectly-timed humor, and is smart enough not to wear out its welcome. The movie's very obvious message is about greed and corruption, but also paints an uncomfortable picture of today's society, as as the hostage situation plays out on live television as "entertainment." Money Monster clocks in at a smart 98 minutes and is rated R for "language throughout, some sexuality, and brief violence." It may not bring much new to the table, but Money Monster is an exciting and well-acted picture that's well worth your movie dollar. Of a possible nine Weasleys, Money Monster gets seven (and fangirl points for Giancarlo Esposito). I found this movie to be the one that made me laugh more often than any other movie I've seen in the past six months. But, I think the movie also demonstrates how executives have pirated the firms we supposedly own (as stockholders) to use (part of; in this case- all) the corporate treasury as they personally see fit and for their personal gain.